The 10 Days Uganda Wildlife Game Viewing Safari will give you the feel of the pearl of Africa taking you to the best tour destination in Uganda. Activities on this safari include gorilla trekking, Savannah wildlife game drive and boat launches, chimpanzee tracking, Ugnad culture and people. From the time you land at Entebbe international airport, with its equatorial location on the forested shores of island strewn Lake Victoria, it is very clear that Uganda is no ordinary safari destination. Dominated by an expansive golf course leading down to the lake shore and a century-old botanical alive with the chatter of acrobatic monkeys and tropical birds, Entebbe its self is the least obviously urban of all comparably sized African Towns. Then, just 40 km distant sprawed across seven hills , there is the capital Kampala . The bright modern feel of this bustling cosmopolitan city reflects the on going economic growth and political stability that has characterized Uganda since 1986 and is complemented by the sloping spaciousness and runaway greenery of its garden setting. 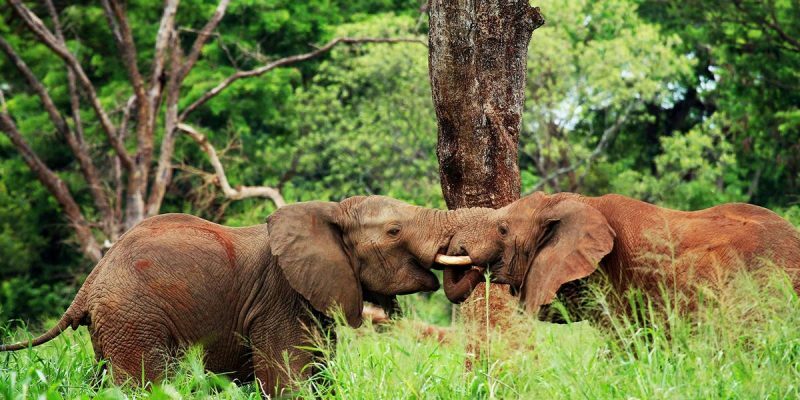 Ecologically, Uganda is where the East African savannah meets the West African Jungle . Where else but in this impossibly lush country can one observe lions prowling the open plains in thee morning and track chimpanzees through the rain forest undergrowth the same afternoon, then the next day navigate tropical channels teeming with hippo and crocodiles before setting off into the misty mountains to stare deep into eyes of the Mountain Gorillas! Day 7: Gorilla Trekking in Bwindi Impenetrable Forest. Take breakfast at your hotel and then later your will be transferred to Murchison falls Np it takes 4-5 hrs. This is Uganda’s largest national park whose palm studded grassland supports dense populations of lion, Buffallo, Elephants, the Uganda Kob together with the localized Rothschild’s giraffe or Patas monkeys. Enormous concentrations of hippos and birds can be observed from morning / afternoon launch trip along the Victoria Nile placed below thee magnificent Murchison falls Np. Have lunch en route and then drive to the top of the falls. Take a cup of coffee and then later you will go for an early morning game drive at the Northern bank of the Victoria Nile. Expect encounters of Lions, Leopards, Giraffe, Buffalo, Elephant, The African Python and many other savannah wildlife. Return for mid morning breakfast and lunch and then later you will be transferred to the Pier to take a launch cruise to the Bottom of the falls. Encounters of hippos , Crocodiles , and many other wildlife will be seen along the shores taking water from the river. There is an optional hike to the top of the falls from the bottom where the boat ride ends. If you are not interested in this, you will be ridden back to your lodge for dinner and over night. Transfer to Kibale National park – Fort portal. Take your breakfast and proceed to to Kibale national park via Hoima to Fort portal. A high light of visit to Kibale National Park will be the Chimpanzee tracking excursion that starts from Kanyankyu at 0800hrs and 1400hrs daily. Encountering man’s closest cousin is stands at over 95% according to 2006 statistics. Queen Elizabeth National park Uganda. Take an early breakfast and head for the park guided walk. (2-3 hours). This park has 12 species of primates including the chimp. Get very clear pictures of the variety in flora fauna and birds. Have lunch and head for Queen Elizabeth National Park via the foothills of foot hills of mountain Rwenzori. Wake up early in the mornings and take cup of tea or coffee. Go for a game drive along Kasenyi track to see the herds of Buffalo, Elephant, Warthog and Lion. Return to the lodge for mid morning break fast. After lunch, a two-hour launch cruise along the Kazinga channel proffers visitors a unique opportunity to encounter at close quarters hippo and a variety of bird species common to the park. At the Buhoma Head quaters of the Uganda Wildlife Authority a ranger guide will brief you about Gorilla trekking protocol. You should carry a packed lunch and water for this activity. The time taken to track gorillas is erratic for it can take 2- 10 hours. This is the one of the unique tour activities that Uganda has. And on encounter of these gorillas, one may be forced to say; it is a worthwhile!!!! Dinner and overnight at your lodge. Very early in the morning, given the little time, take breakfast, then take your drive to Lake Mburo National Park. A game drive today will enable us to see the zebras, topes, elephants, elands, impalas, buffaloes antelopes , etc. Placed in the one part of Uganda enclosed in extensive acacia woodland, Mburo has noticeably different fauna to other reserves. It is the best place in the country to see the enormous eland antelope , topi, as well as zebra, impala, and several acacia-associated birds.The five lakes enclosed with in this park attract hippos, crocodiles and a variety of waterbirds, while fringing swamps hide secretive papyrus specialists such as the sitatunga antelope and red, black and yellow papyrus gonalek. After breakfast, have a brief early morning game drive and then transfer to Kampala, then to Jinja where we visit the Source of the River Nile. Places to visit are Bujagali Falls, the Source of the Nile . Hotel Triangle all with water view. After breakfast, you will then be be taken to the starting point of the white water rafting – do a half day water rafting or transfer to Mabira Forest for a short forest walk ( optional and can be done at an extra cost) and then transfer to Kampala or to Entebbe for your next flight back home .